New Horizons offers attractive and functional car wash enclosures in a variety of sizes to meet any budget and space consideration. We manufacture products for both automatic car wash structures and self-serve car wash enclosures that can be customized with a number of useful features, including equipment rooms, kneewall upgrades, awnings, overhangs and other decorative roof features. If you’re considering opening your own car wash or expanding an existing facility, contact us today to discuss our full range of offerings. Our automatic car wash buildings come in five standard sizes and a variety of different configurations. 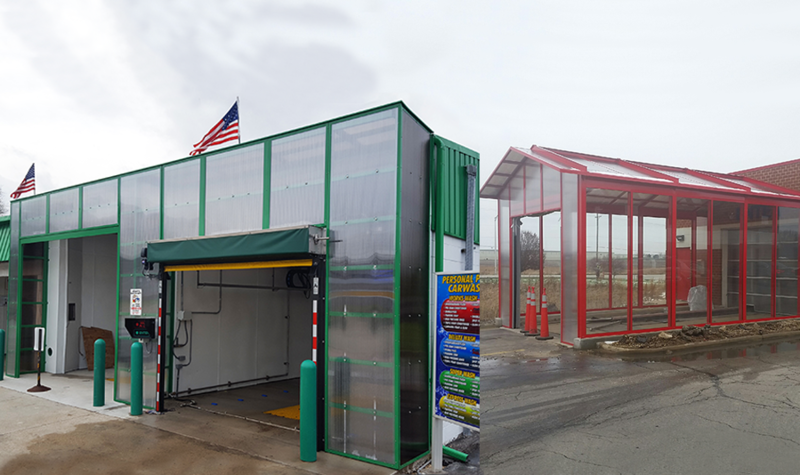 A standard enclosure features a 10′ by 10′ car wash bay size, large enough to fit any unmodified passenger car, truck or SUV on the market today. We can also custom manufacture a double-wide building to accommodate Autec automatic and touchless car wash systems. When choosing car wash dimensions when building your self-service car wash, remember that a larger enclosure will give you more options down the road in terms of the kind of equipment you can use and the services you can offer. Our self-service car wash enclosures utilize a modular system that gives you greater flexibility and room for expansion. We offer our self-service car wash bays in over 80 colors and can also add vacuum islands, equipment rooms and other custom features. Our standard modules measure 6′ 4″ wide by 20′ long — with modular construction, you can add as many as your budget permits. Best of all, when you’re ready to expand, it’s easy to add more! Contact New Horizons Car Wash Today! We’ll be happy to work with you and put together a package that gives you the most value for your money. Contact us today about out custom car wash building dimensions!